To create this Christmas card I started with an aqua card base. 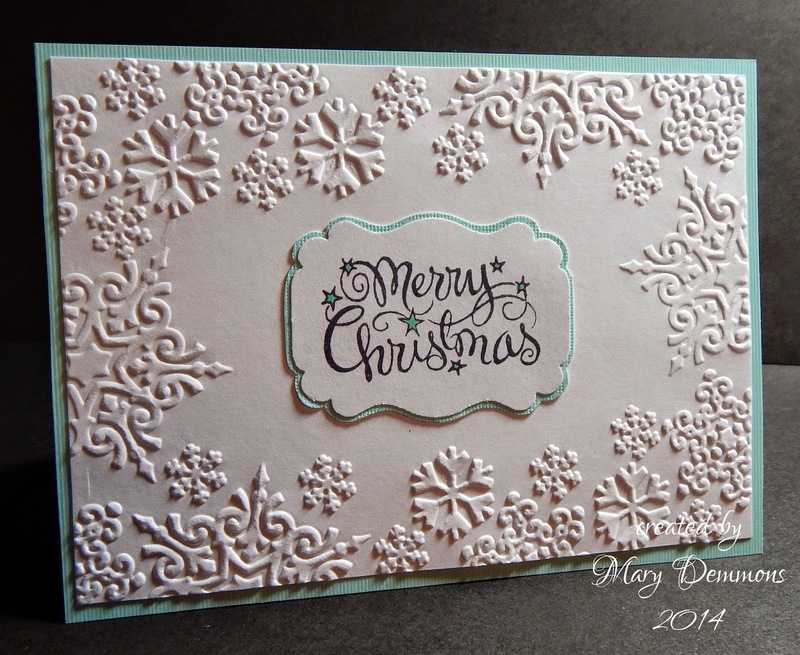 I embossed a piece of white card stock using my Sizzix machine and a snowflake embossing folder. I stamped the sentiment onto a piece of white card stock, punched it out using the Real Estate Sign punch from EK Success. I colored in the stars using Spectrum Noir pens and backed it in aqua card stock. I added crystal stickles to the stars on the sentiment. What a beautiful card with an elegant touch. Love it. Thanks for playing along with us at Frosted Designs. What gorgeous embossing really makes your card so special. Thanks for joining us at CHNC challenge 2. This is so elegant and gorgeous!!! Thanks for playing along with us at Frosted Designs!! Lovely Card. Thanks for joining us at Frosted Designs. Pretty card - love the snowflake embossing!! Thanks for joining us at Frosted Designs!! Gorgeous card, love it! Very stylish! Thanks so much for joining us at Crafty Hazel Nuts this month.